Success by Health provides no information on their website about who owns or runs the business. The Success by Health website domain (“successbyhealth.com”) was privately registered on February 15th, 2017. The registration was last updated on January 31st, 2018. Success By Health is a division of Success By Media LLC. RED is brought to you by Success By Media. SBM’s CEO is Jay Noland who will be the Lead Trainer of the Red Event. Although not explicitly confirmed on the Success by Health website, it is assumed Jay Noland is also running Success by Health. 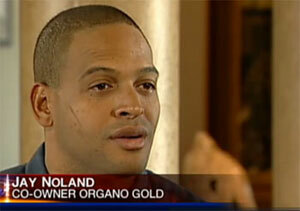 Noland first appeared on BehindMLM in a 2014 article covering when we reported on his fallout with Organo Gold’s other co-founders. After Organo Gold Noland went on to launch his own coffee MLM company, SereniGy. SereniGy launched in 2009 and was bought out by Rain International in mid 2015. According to his LinkedIn profile, Noland was Rain International’s Chief Sales Officer from August 2015 to October 2016. At Success By Media, we believe in training differently. We want to help you and your business reach your full potential and every goal you set. Our cutting edge media services, training services, virtual learning systems, and professional coaching enables you, your staff, and your teams to excel at top performing levels in record time. We will create customized, consistent, and comprehensive training and media service that will far exceed your expectations. That is our promise. Read on for a full review of the Success by Health MLM opportunity. Success by Health markets a beverage line under “MycoCafe”, as well as a range of nutritional supplements. MycoCafe includes both coffee and tea varieties. SBH blends gourmet proprietary roasted Coffee Beans with Ganoderma and other Myco-herbs. This helps to naturally reduce the negative effects of caffeine and helps to build the immune system. Note that at the time of publication only the black coffee and latte lines appear available. The rest of Success by Health’s beverage line is marked “coming soon”. Success by Health’s nutritional supplement range is marketed as “nutraceuticals”. Success by Health’s compensation plan does reward affiliates for selling to retail customers, however most of the plan however is geared towards affiliate autoship recruitment. Success by Health affiliates are paid to sell products to retail customers. Retail commissions within Success by Health are defined as the difference between the wholesale and retail cost of products ordered. An “average profit per (retail) customer” amount cited in the Success by Health compensation plan is $45. Success by Health affiliates are paid to recruit new affiliates who sign up with Accelerator and Super Accelerator affiliate packs. If a Success by Health affiliate sells three packs (any combination) within their first seven days, they receive an additional $50 in product credit. Success by Health pays residual commissions via a unilevel compensation structure. Success by Health caps payable unilevel team levels at five. Although not strictly a residual commission, Success by Health also pays a 10% residual commission on an affiliate’s personal orders and retail sales volume. The Infinity Bonus is a generational bonus that extends residual commissions beyond the initial five offered levels. A generation within the Success by Health compensation plan is defined when a Super Business Affiliate 1 or higher ranked affiliate is found in a unilevel leg. If no second Super Business Affiliate 1 or higher ranked affiliate exists deeper in the leg, the second generation extends the full depth of the leg. Using this generational structure, Success by Health affiliates can earn an Infinity Bonus on up to four generations in each unilevel team leg. Super Business Affiliate 1 rank qualification requires a Success by Health affiliate to generate ‘at least $15K in Team Affiliate Sales‘. There is no indication of whether this sales volume is accumulated or monthly recurring. Nor does Success by Health provide qualification criteria for Super Business Affiliate 2 and higher. The BAM Bonus rewards Success by Health affiliates for recruiting affiliates on autoship. Basic Success by Health affiliate membership is $49. 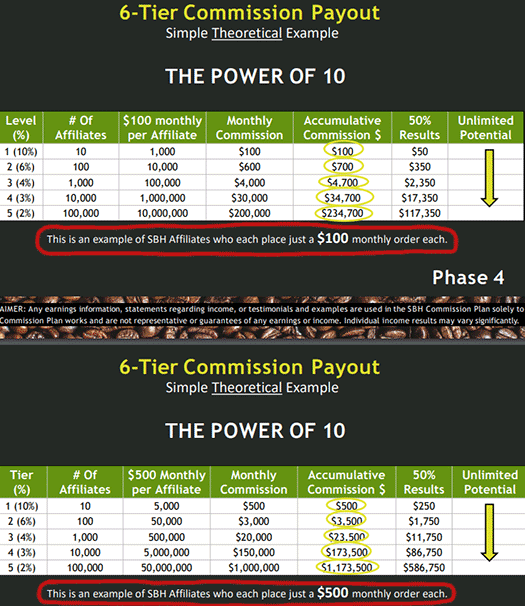 The Success by Health compensation plan however suggests these affiliates only earn direct retail commissions (non-MLM). The Success by Health compensation plan also mentions a “SBH Social Selling System”, which I believe is an additional undisclosed monthly cost. …which makes the affiliate autoship recruitment focus of Success by Health all the more disappointing. The only component of Success by Health’s compensation plan that focuses on retail is a flat 10% commission. The rest of the compensation plan focuses on affiliate recruitment, with a clear slant towards recruitment of $100 and/or $500 monthly autoship. Before we get into that though, let’s start with Success by Health’s “promotional packages”. For starters, forcing affiliates to purchase products to qualify for commissions is “pay to play” which, from a regulatory standpoint, is frowned upon. Then there’s the fact that there is absolutely no justification for the offering of a $1995 affiliate package, when Success by Health’s products cost between $20 to $79. This does nothing but encourage inventory loading, and perfectly exemplifies why tying mandatory product purchases to commission qualification is a bad idea. That Success by Health expects affiliates to focus on recruiting Super Accelerator Pack affiliates is obvious. The $500 pack is described as the “fast way to grow SBH Affiliate Business” and the $1995 pack the “fastest way to grow SBH Affiliate Business”. The fastest way to grow a Success by Health business should be by generating retail sales, not spending $1995 on an unreasonable amount of product for a new affiliate. Moving onto the Success by Health compensation plan, we have pyramid commissions paid out by way of direct commissions paid on Accelerator Pack recruitment. The examples instead offer calculations based on the recruitment of ten affiliates on $100 autoship and $500 autoship respectively, calculated down five levels of recruitment. And then you have the BAM Bonuses, which all but cement Success by Health’s autoship focus. The BAM Bonus literally rewards affiliates for recruiting affiliates on autoship. To be clear: retail sales are possible within Success by Health and are paid out on, but when you examine the opportunity as a whole, it’s more than obvious what the company wants affiliates to focus on. As to the products, I doubt there’s much between Success by Health’s ganoderma offering when put up against Gano Excel, Organo Gold and SereniGy. That’s not necessarily a bad thing, it just casts doubt on whether Success by Health is a genuine MLM opportunity launch or an autoship recruitment cash grab. I suppose the addition of nutritional supplements might swing that argument towards the former. That’s only if you ignore Success by Health’s compensation plan however. Like I said, a pretty disappointing opportunity launch from a self-professed “legend in the direct sales industry”. Jay has built multiple massive sales organizations that span the globe, numbering approximately 2 Million members, generating Billions of Dollars in sales. Someone who’s purportedly had that much success in the MLM industry should definitely know better. Jay Noland is a fraud!! Run very fast away from this company!! The FTC is already hot on his tail! He will go down don’t go down with him. He doesn’t pay out correctly and is running a pyramid scheme 100%. Poor suckers he has thinking they are top dogs. Manipulated. Straight from Russellville Ky! Poor kid! Personally, I think Jay Noland’s business is solid. The former affiliate comment above is crap. It’s amazing how people can be such negative dream stealers. Don’t let this no talent having fearful loser stop you from pursing a business model that has enormous potential to grow and expand world wide for you and your team. The difference to me is the fact that it appears that all levels make money in successbyhealth. Whereas other business only pay the top tiers. Furthermore, it appears that Jay Noland’s business is a positive force for good considering the health and wellness messaging and focus on products that do the body good.